Today’s post focuses on two types of low-tech makerspace programming currently being developed and implemented at the Denver Public Library’s Children’s Library. While facilitated by all of the children’s librarians at the Children’s Library (myself included), these programs have been developed by my two innovative colleagues – Carrie Wolfson and Liesel Schmidt. For this post, I chatted with Liesel and asked her to provide insight into the creation of these super fun and very successful programs. Open Studios allow participants to explore different art media like watercolor paint, oil pastels or clay. 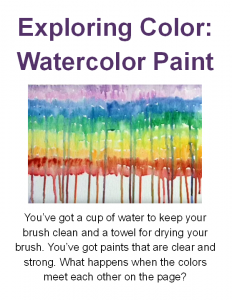 We make real art materials available to visitors, along with suggestions of techniques to try. It works to demonstrate examples of new techniques that will allow participants to further explore the media without prescribing a “correct” way to make the art. 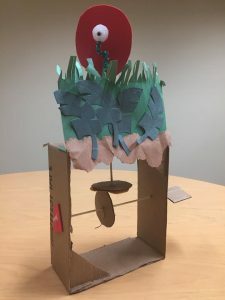 Marble Machines and Cardboard Automata, our pilot Tinkering Programs, were both inspired by materials from the Exploratorium Museum’s Tinkering Studio. 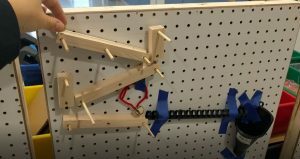 Marble Machines allows participants to collaborate to create a pathway for marbles to move down a pegboard. Cardboard Automata gives participants a chance to experiment with simple machine elements through cardboard. Both programs facilitate learning by making. Liesel said, “There is a theory of learning called constructivism (developed by Seymour Papert). Constructivism focuses on the way that we learn through observation and experience. When participants try new art techniques or create their own technologies, they are learning in a deeply meaningful way.” Programs work well for many ages, but specifically target grades 1-5, and, as Liesel pointed out, they also offer chances for cross-generational collaboration. When I’ve facilitated these programs, we’ve done them in a drop-in fashion. The program usually lasts 2 hours with a usually steady flow of customers. I begin by greeting and then orienting newcomers to the space, materials, and project. Liesel calls staff facilitators, “cheerleaders, sounding boards and occasionally active teammates.” We help kids work through struggles to achieve their desired outcome. We may encourage them to talk through the problem, ask targeting questions (“So you want the marble to slow down so that it doesn’t fall off the board here. What could you do to slow it down?”), and then step away once they have an idea of how to proceed. Another very intentional and crucial element of these programs is room setup. Consideration is put into how materials are laid out, as well as the configuration of tables, chairs, and other furniture. We encourage participants to choose their own materials and let them know how they ought to clean up when they are done. Often, we’ll demonstrate techniques as part of the introduction to the space, but our goal is to stop short of showing the way things should done. Speaking of materials, what’s needed for this type of makerspace programming? For Open Studios, our goal is for participants to use real art materials. 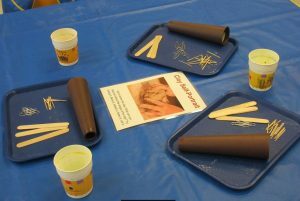 We like to tell kids that the art supplies are “just like the ones real artists use.” For Tinkering Programs we use a variety of upcycled materials curated specifically for each program. All of these programs are low-tech because they don’t require much technology beyond a glue gun or two. However, we like to think kids are creating their own technology by creating simple machine and other creations. As a facilitator, I have found it helpful to remember that it’s okay not to interact with kids all the time, especially if they are engaging with other kids or their grown-ups. If I’m always right there, kids will often ask me before experimenting. So I’ll busy myself with tidying in another part of the room to give them space to troubleshoot on their own. Interested in giving an Open Studio or Tinkering Program a try? Feel to reach out to Liesel at lschmidt@denverlibrary.org. Amy Seto Forrester is a Children’s Librarian at the Denver Public Library, Denver, Colorado. She earned her MLS from Texas Woman’s University. An active ALSC member, Amy is currently serving on the School Age Programs and Services Committee. She has previously served on the Library Services to Special Populations Committee, as well as the 2016 Geisel Award Committee. She reviews for School Library Journal and the Horn Book Guide, and is a co-host for Guessing Geisel.